Constant Spring Hangers with Loads up to 105,000 Lbs. 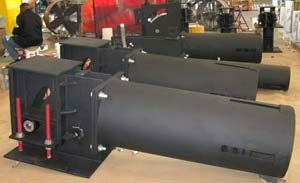 | Piping Technology & Products, Inc. Constant Spring Hangers with Loads up to 105,000 Lbs. 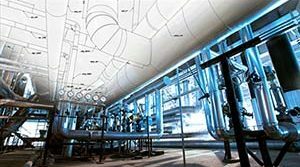 Piping Technology & Products, Inc., custom designed and fabricated a collection of constants for an oil refinery in New Jersey. This application required the use of suspended constants, 100-C and base constants, 200-F. In order to support the lines at the oil refinery, PT&P designed the 100-C constant spring hangers (vertical constants suspended from beams) at two different loads and total travels. The 100-C constant with a load of 105,000-lbs. and total travel of 6″ (figure 1) is set to travel 1-3/4″ down and 1-15/16″ up. It is 38-3/8″ in width, 79-1/4″ in height and furnished with a double lug suspension to allow it to hang from a double point suspension beam. In comparison to the aforementioned constant, this particular 100-C constant spring hanger (figure 2) has a load of 33,000 lbs. and a total travel of 4-1/2″, 3/8″ up and 1-1/2″ down. This specific constant is 24-1/4″ in width, 71″ in height and also furnished with a double lug suspension to suspend from a double point suspension beam. Although the dimensions of these two constants are similar, the size of the springs and cams are very different. Opposed to the 100-C constant, the 200-F constant spring hanger is a horizontal constant used to support piping from below. 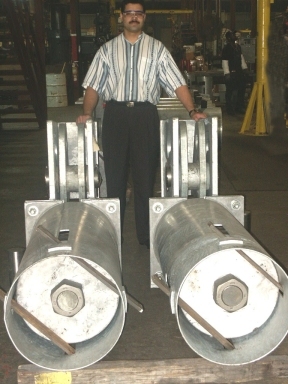 These 200-F constant spring hangers were designed with loads of 40,750 lbs. and total travels of 4-1/2″, 3/8″ up and 1-3/4″ down. 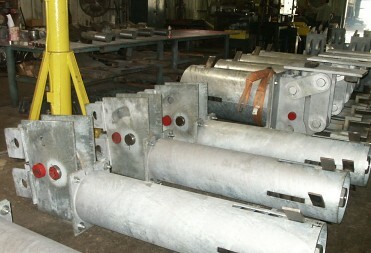 These constants will be used in conjunction with sway struts to support pipelines at the oil refinery. Learn more about constants spring hangers by visiting our website archives!